Made up of 115 glittering islands, each with its own charm, it’s not easy to decide where you’re going to spend your time in the Seychelles. With so much variety on offer, this is certainly not a case of once you’ve seen one island, you’ve seen them all. A combination of the two largest islands of Mahé and Praslin is the perfect option for those that want to experience the Seychelles’ varying landscapes and spectacular beaches. If you’re after an authentic insight into island life, visit Praslin before heading to La Digue, where village life exists at a slower pace. Nature-lovers will get the most from a holiday that includes Mahé and Silhouette, where extraordinary national parks await. 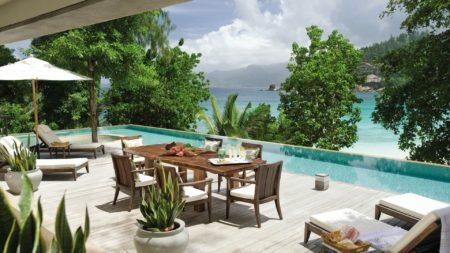 The Seychelles enjoys gloriously sunny days throughout the year. Peak season here correlates with our summer months, where days are longer and the sun is cooler with only a little rain. April and November are hot, humid and wet, yet the temperate remains a balmy average of 30°C. The wettest period is January and the driest is July. Temperatures reach up to 22°C in winter and up to 34°C in summer. Direct flights from the UK to Mahé in 11 hours 45 minutes.